Will India’s economy be at the level China’s is at now in the next 5 years? Questions like these have been popping up on Quora at a very fast rate, to all the Indians who ask these questions the only reasonable conclusion I can come up with is that Indians seriously underestimate China and the Chinese people’s capabilities. China had perfected all the correct fundamentals for development, they have built world class infrastructure with a record spending on infrastructure that is the highest in the world, but the problem is that India needs to spend far more on infrastructure and it is not, this will hinder India’s growth substantially, Indian policy makers don’t seem to understand this. China gave quality education at a massive scale to its citizens, the result is that even the rural areas in China rank at the OECD average (PISA) and Shanghai which is the best in China absolutely smashed the rest of the world in education, India came last in the PISA rankings and it opted out, this shouldn’t be the response for a country which wants to be a global superpower, Indian skilled labour is also low quality which is a result of bad educational policies and low standards and this will hamper India in a future where the world is moving towards high skilled labour. 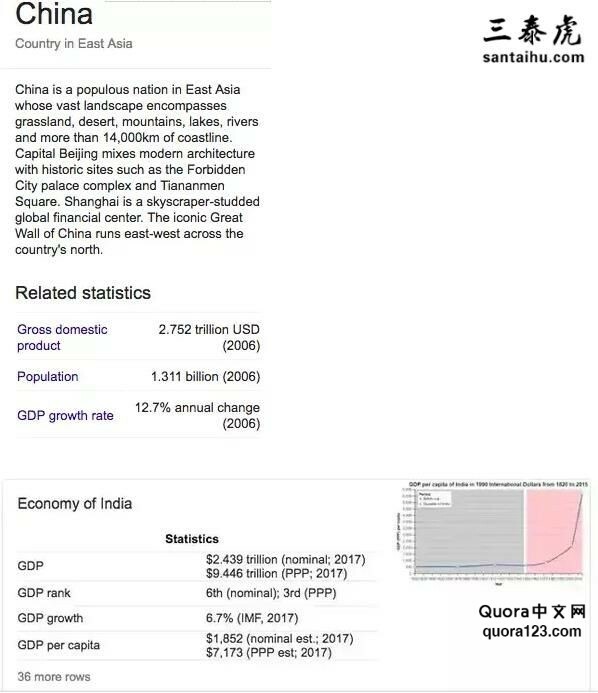 Indians seem to be very proud of the fact that the 7.37% growth in GDP for 2018 is faster than China’s growth which is 6.9%, sure being proud is essential as well but one should also be pragmatic, what Indians don’t seem to quite comprehend is that since China’s GDP is much much larger than India’s it actually adds more value to its economy even though it grows “slower”. Chinese GDP for 2017 is $12.25 trillion while the respective figure for India is $2.439 trillion the growth rate during this period for each economy was 6.9% and 6.7% respectively, that means that in absolute terms China added an incredible $1.7 trillion to its economy while India added $362 billion to its economy, in other words China added a bit more than x4 what India added to its economy. Though both economies are comparable we can see that the growth rate exceeds 10% in China while in India it is much lower, I believe it is essential that India grows in excess of 10% at this stage or else it will really struggle to pull a vast amount of people out of poverty and might get stuck in the middle income trap which would be the worst nightmare for India. India tried to do a rather unconventional economic strategy, that is jumping straight from agriculture to services while China was and is completing the standard economic strategy that all developed countries followed that is agriculture to manufacturing to services at a rapid rate, India is now joining the manufacturing bandwagon but it is probably too late for that now as the world is heading into automation. Since it is too late to follow the conventional development strategy India is really on its own to develop a country of 1 billion at a massive scale. And no it certainly won’t surpass China in 5 years time because India’s GDP then would be $3.9 trillion and China’s? that would be $18.3 trillion and for reference point the US GDP would be $23.5 trillion. If India grows on a average of 8%(may be i am too optimistic) in next 5 years and China grows at 5(may be i am too pessimistic) . Interestingly even with low growth China would have added more amount to GDP as India would have added to GDP. So no way , India’s economy is not going to be at the level of China’s in next 5 years. 1)Infrastructure and lack of quality education. 2)India has not yet come out of socialist clout that it has been embroiled for past 5–6 decades. 3)India has not gone full heartedly towards Globalisation. 4)Structural barriers like caste system makes it very difficult to overcome inefficient traditional business practices. 5) One of the youngest Nations with more than 50% population under age of 40, but these young youths don’t have the entrepreneurship vigor. 6) Added to this “Land” , If Government is not able acquire land for social programs then think of private corporations who needs to setup big industries, this is a very serious problem.Amendments to change that law was put down in 2015 after vigorous protests from Opposition and People. So , considering all these i wonder whether India will ever reach those heights in near term. May be after 20 years but definitely not now. This too considering all the above problems are somehow solved in next 5–8 years. India is a nation of enormous potential but the social barriers hindering its fast growth.